Treppenbau Diehl, based in Frankfurt am Main, Germany, is specialized in the development, production and set-up of individual design stairs. 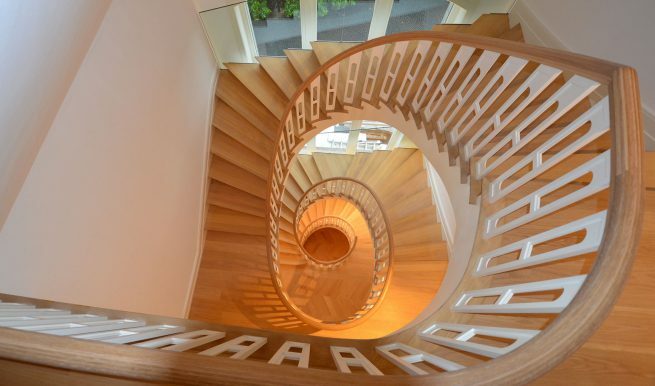 Founded in 1971, the company stands for exclusive custom high-end staircases. A 5-axis machine controlled by Staircon CAM 5+, is used to machine the stair parts. “We use Staircon for sophisticated stair design and to control and steer the CNC machining in the manufacture of our stair components. As a user, we have to meet high-end demands every day, and the user-friendliness in the operation of the Staircon software is helping us achieve that. Different design options can be pre-configured to easily create even the most innovative stairs. In addition, the service of Staircon is very friendly and helps us with wishes and questions quickly and competently.